Official rules of volleyball for PAVO NCAA, NAIA, and NJCAA. The following are significant changes and points of emphasis. The entire playing area must be visible to all team members and officials. Failure to comply results in an individual sanction to the head coach or the offending coach, at the discretion of the referee. During play, coaches must remain at least 1.75 meters from the court. Failure to comply with the correct coach position during play results in a delay sanction. Only inadvertent whistles or horns that affect play will result in a replay. When a protest is lodged the coaches will sign the protest documentation rather than the captains. Interference by media equipment with a players legitimate effort to play the ball in the playing area will result in a replay. Shadow trim must completely surround a jersey number. If one player wears it, all players wear it. The location of the warm-up area is now 1.75 meters from the court and service area. Coaches may make requests for substitutions, timeouts, or lineup checks from anywhere in the bench area, including the warm-up zone. It remains the coachs responsibility to communicate the request clearly to the second referee, regardless of the coachs location at the time of the request. By agreement of both coaches, timeouts in a non-broadcast match may be extended from the 60-second default length to the same length as a media timeout (75 seconds to 90 seconds). If coaches do not agree to an extended length, the default of 60 seconds will be used. Additional resources may be used if needed by the referees or tournament protest committee in the case of a score discrepancy that results in a protest. When a protest has been lodged regarding a scoring discrepancy, in addition to reviewing the scoresheet for errors and consulting with all assigned referees and scorekeepers (including the alternate official if one has been assigned), the referees or protest committee may also: review information from an official statistician if an electronic play-by-play system is in use, if the resource is not available, the referees may use information from the teams bench statisticians or scorekeepers, provided both are in agreement as to the score and/or sequence of events. The language will be expanded to include non-player team members as well as coaches in the restricted area during play. Additional language will allow a captain to act as a coach if no coach is available. A clarification has been made to indicate that if a protest is upheld and the teams choose not to replay the match from the point of protest, the official result of the match is recorded as a no contest for both teams. Added to provide further guidelines for net system choices and facility recommendations. Added to provide information about training and certification opportunities for referees, line judges, and scorekeepers. Added to delineate the Alternate Officials duties, if one is utilized for an event. Guidelines for the announcers duties and tasks have been added. -	on libero tracking deciding sheet, dont move over lineup until they switch sides. The following information is presented in an effort to clarify the 2008 Ball Handling Directive and to provide for more consistent application of Rule 14.2.3.2.
o	outside influences such as player technique, spin, coaches expectations, or crowd reaction should not be considered when judging the legality of the contact. o	There is no body/ball position or playing technique that automatically results in illegal contact. If the referees identify that court markings are not legal and cannot be remedied, the referee will communicate with the school administration or conference, and the NCAA secretary/rules editor; however, the current match will be played. The specifications for net height and antenna placement are the responsibility of event management. If the net set-up is done correctly, the referees confirmation will take only a few seconds, minimizing the disruption to the warmup protocols. Related technique  measuring the net. It is vital that the liberos jersey differ significantly from her teammates jerseys. The official rules of volleyball state that the libero must wear a jersey that is immediately recognized from all angles as being in clear contrast to and distinct from her teammates. Both pattern and color-contrast must be considered. Combinations such as burgundy and black, dark green and black, old-gold and white, and light pink and white do not provide sufficient contrast. 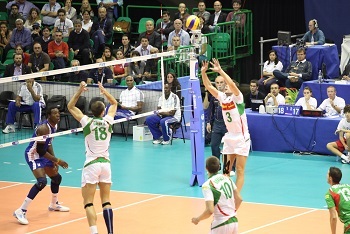 In order for the pursuit rule to be utilized, the official rules of volleyball require at least 2 meters of free space between the pole and the score table, and behind the first referees platform. That measurement must take into consideration the pole padding, walkways for fans, fans location on the first row of bleachers, etc. Only if there is actually 2 meters of space after all of those are taken into consideration may be use of the pursuit rule be approved by the referees. Second referee goes to position, signals number of timeouts taken and gives readyvolleyball hand signal. When is a delay sanction appropriate? -	a delay sanction is only appropriate if the second referee has made efforts to get the team out of their huddle and the teams response is delayed. -	If a team is a bit slow, consider speaking to the coach to remind him/her that further delays (that is, failure to respond to the second referees instructions to take the court) could result in a delay sanction. -	However, a blatant delay after being instructed to take the court should be immediately sanctioned without verbal warning. If teams return to the court early -	second referee whistle at :15 if one or both teams are still at their bench -	if both teams are on the court and ready to play before time expires, second referee whistles loudly to end the timeout (be sure the clock operator stops the clock or turns off the automatic horn) -	second referee goes to position, signals umber of timeouts taken and gives ready signal. -	if the second referee is otherwise occupied and misses any of the above described whistles, then first referee should whistle instead. -	Also, if the second referee is occupied and does not see a request for TO orsubstitution, the first referee can acknowledge the request by whistling to acknowledge it. -	only the contact point should be considered when judging legality. -	There is no body/ball position or playing technique that automatically results in illegal contact. -	less severe judgment is applied to a contact by a player who makes a challenging or spectacular play. -	An egregious fault should still be called, regardless of the challenging or spectacular nature of the play. Call what you actually see Trust yourself  dont be influenced by outside factors Anticipate but never assume. o	whos going to verbally communicate pertinent information?